Beautiful & comfortable 1 bdrm suite with lake view in premium location! Our modern 1 bedroom Loft is situated in the trendy north end of Kelowna also known as the Cultural district. The suite is located in the carriage house on our property, it is detached from the main house and has its own separate entrance, parking and private covered patio with lake view. The inside is beautifully decorated in casual modern flair. From Quartz countertops to stainless appliances, walk in shower, luxurious linens, electric fireplace and 50” TV, you will find everything you need to make your stay comfortable and complete. From here you are steps to Okanagan Lake and Knox Mountain Park where hiking, biking and walking trails are endless. Spectacular views reward you once you reach the top! A short 10 minute walk or 5 minute bike ride will take you to popular eateries, craft breweries and pubs where you can enjoy a refreshing drink and visit on a cool misted patio. A 1.7km walk, bike or drive will take you to the heart of vibrant downtown Kelowna where you will find an abundance of coffee shops, restaurants, pubs, shopping, water sports rentals and entertainment. After a day at the beach, golfing or wine touring, relax on your own private patio with lake view and equipped with a natural gas BBQ for your grilling enjoyment. Or, maybe you go for a "cruise" along the lakeshore on our His & Hers Cruiser Bikes we have available for your use during your stay. The central location means you are an easy drive to many wineries, golf courses and touring. Covered parking and secured storage for bikes offered. Great hiking and mountain biking at Knox Mountain steps from here. Sofa pulls out to double bed. A small assortment in case you forget yours! His & Hers Cruiser Bikes made available to our guest's during their stay! Large covered deck. equipped with patio seating and table. Also has a remote controlled solar screen that can be utilized if you have had enough sun for the day. The suite is just beautiful, very private and covered parking to boot. Great location, I could walk to the downtown area in just a few minutes. What an amazing stay we had at this immaculate carriage home. It was sparkling clean, bright and beautifully located, within walking distance to so many wonderful activities! Thanks for all the extra special touches and great communication from start to finish. Thank you Sherry for the great review! So glad you guys enjoyed your stay! Looking forward to a return visit and meeting you two! Stylish, very clean and comfortable amenities, thoughtful host, sincerely great for vacation. Impressive from the first glance, the place is elegant, well designed, equipped with all necessities and very clean. Central location, short distance to waterfront and easy access to routes toward winder playgrounds. The hosts welcomed us warmly and accommodated our extra request, then ensured privacy. Sincerely recommended for a relaxing vacation. Thanks Romeo, we are glad you enjoyed your stay! Hope to see you again. Sparkling clean, modern and comfy accommodation. 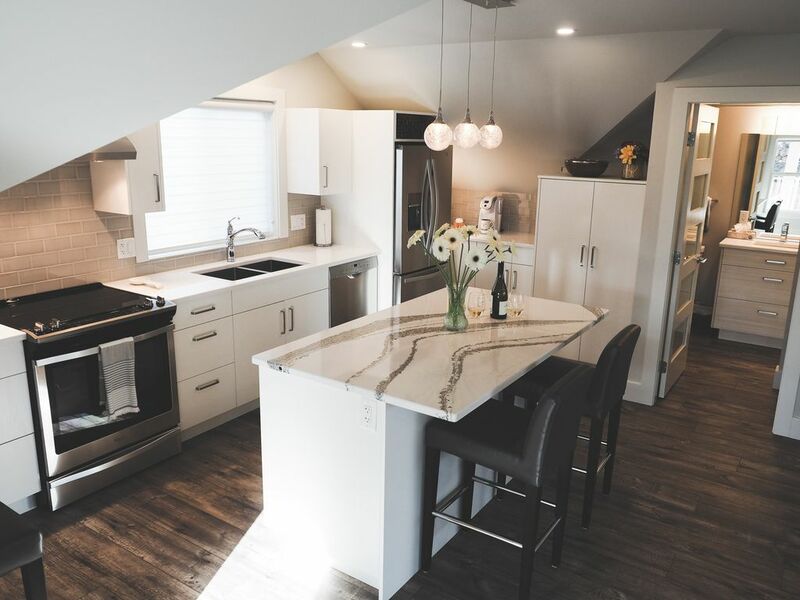 The Urban loft is modern, clean and cozy and is located in our favourite neighbourhood of Kelowna. We are walkers and this place is a perfect location for us. The property is a block away from the Knox Mountain Park. A short walk in the opposite direction take one to a lake shore and wetlands and water feature walk that goes right to the heart of the city and all it has to offer. This really is a spectacular location for people who like to walk or cycle. It is near easy routes for driving in Kelowna. The kitchen is well equipped for serious cooking and even has a full set of sharpened knives! The loft is perfect for a couple and the bed is really comfortable. The modern bathroom is bright and beautiful. The hosts are friendly, obviously take pride in their property and are available without being in any way obtrusive. There is a working mill across the street from the property but it is not noisy or unpleasant and there is still a lovely lake view. We totally enjoyed our stay and we hope to make it our go to home when visiting Kelowna. Thank you Richard & Janet! We are so happy you had such a great stay & look forward to seeing you again! Happy New Year! Really enjoyed my stay in Kelowna due in part to this great apartment. Thank you for your review Cristy! Glad you found the place comfortable & accommodating! It was a pleasure to have you and we look forward to your next visit! Absolutely stunning carriage suite which belongs in Western Living magazine. Wonderful hosts with every detail attended to...complete with his and hers cruiser bikes to tour around town. Excellent downtown location in close proximity to parks, restaurants, and businesses. You will not find a better rental in the area. Thank you Stacy and Ernie! Thank you Scott & Karrie! So glad you had fun "cruizin around"!! See you two again I hope!